Noted for its five star accommodations and its pretty walkway over the water with viewpoint, private shady cabins and beach named after Ernest Hemingway, the Meliá Cayo Guillermo is the ideal choice for fans of scuba diving and fishing, thanks to its rich marine life. 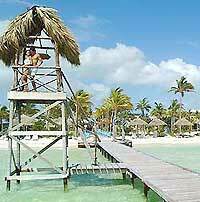 As many of the nearby hotels, the Melia Cayo Guillermo operates on all-inclusive basis. Guests can enjoy a lobby bar, snack bar, a Swing Latino pub, sports bar, beach bar and cigar bar, so good quality snacks, beverages and cocktails are available all over the resort. There is also a wide and exquisite range of dishes at each one of the 4 restaurants serving international buffet, Italian dishes, à la carte dinner and grilled specialties. A business centre is available at the property and other options such as gym-spa, massage, tennis court and other sports facilities or live music and non-stop entertainment are also available. Besides, activities like ecological excursions, horseback riding, trekking, mini golf, bowling and bird watching can be easily arranged, too. Bird lovers should know flamingos, gulls and pelicans are very common to see in this area. Located in the midst of beautiful, tropical surroundings, the classic rooms at the Meliá Cayo Guillermo provide lovely views of the gardens. They are modern and comfortable. Junior Suites, on the other hand, are located on the second and third floors, with beautiful views of the gardens, too. Quiet and with a king size bed, they are ideal for enjoying with all the family. They all come with satellite TV, air conditioning and safe. Bathrooms are private and come with shower and hairdryer. Also the rooms feature a mini fridge and coffee maker.